It is imperative that you look for a high quality floor scale with a digital indicator that encompasses no less than a 32 bit RISC based high resolution programmable indicator. These displays indicate multiple readings that include, but are not limited to, weight, items description and tare information. Many of these digital indicators allow for the entering of numerical and textual information that can be entered using the 0 Ð 9 numeric keypad. The features associated with the digital indicator also allow users to detail descriptions for parts counting and layouts for printed labels. For added durability of your digital indicator, in some applications, it is wise to opt for the stainless steel option. The portable digital indicator is especially useful with floor scales as they have the ability to be mounted on a wall or bench top. This makes it easier for the user of the scale to conveniently view the reading after an object is weighed. Displays that are a part of the scale housing may be covered in the event that a larger or oddly shaped object is being weighed. This would make is very difficult to gather an accurate reading while weighing the object. In addition to the viewing benefits associated with a portable digital scale indicator, the high quality indicator offered by Arlyn Scales is also equipped with a water resistant shock absorbent plastic enclosure, seven built in unit conversion units, simple menu driven interface and optional multiple platforms. You also have a user defined unit conversion with up to 480 memory locations to store tare and part counts readings. Aside from the digital readout, there are other scale essentials that can help determine the quality of a floor scale. 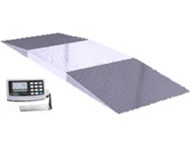 Arlyn Scales offers floor scales with specialized alloy stainless steel load cells that are accompanied by leading edge electronics. This allows for the floor scale to have high levels of accuracy and repeatability. These scales vary in capacity with the standards ranging anywhere between 2500lbs and in some cases exceeding 20,000lbs. The great thing about Arlyn Scales is that we customize. If what you are weighing requires a larger capacity, our staff of experts offers the expertise and technological ability required to accommodate your need. For more information on digital floor scales with Arlyn Scales and to find the scale that is right for you please feel contact us at www.arlynscales.com. We look forward to assisting you today!